Whether you have a design in mind or you need help from our experienced design team, let’s get the ball rolling. Aeration allows greater movement of water, fertilizer & air which stimulates healthy turf. Aerating also increases the speed of decomposition of the grass clippings & enhances deep root growth. Compacted soil especially benefits from core aerating. Soil supplies some of the nutrients that grass needs, but most soils are not able to provide all of them during the entire growing season. A healthy & actively growing lawn uses a great deal of energy. Fertilizer helps your lawn stay healthy by promoting new leaf & root growth. Spring cleanup services prepare your lawn for the coming growing season. Removing fallen debris is necessary to allow grass & plants to grow strong & green. Weekly Maintenance includes cutting, edging & line trimming to maintain a uniform appearance throughout the summer. Pruning service involves removal or dead or loose or infected branches so that the shrub can flourish properly. It is also done to give a particular shape to the shrub for aesthetic purposes. Trimming service on the other hand is done to remove overgrown bushes which prevents the shrub from receiving enough moisture & light. Power raking is also known as an effective means of thickening up bentgrass lawns & removing excess organic debris, which builds up on your lawn over the fall & winter. Power raking also improves intake of nutrients in the soil & roots of your lawn & helps to prevent pests & diseases. This process stimulates new growth, thickening your lawn. Premium hardwood mulch includes only the bark off the tree & does not include the actual wood. It is ground three times to give a nice uniform, fluffy texture. Great product to use for new installation & for areas where plants need lots of nutrients. 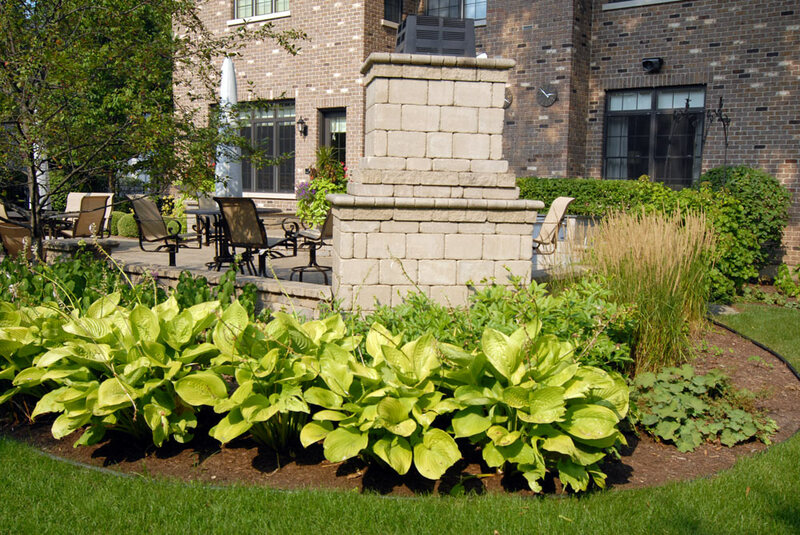 Now that your property has been beautifully landscaped, it is important to maintain it. Professional landscape maintenance is the easiest way for you to ensure your property is in top shape all year long. Ongoing maintenance is important for healthy plants & trees. Unsightly weeds & fungi not only look bad, they steal soil nutrients, water & sunlight that your landscape plants need to grow properly. Without ongoing control efforts, they will take over. Regular weeding will avoid this problem & will keep plants growing well. The Finish Grade is the foundational manicure of every fine lawn. It provides the final shaping & prepares the seed bed or sod base for completion. Landscaping trees come in all shapes & sizes & can be some of the biggest assets to your yard because they provide shade, privacy, visual interest & other uses. Evergreens are a natural choice for any part of the country, because these conifers remain true to their name by adding cool green & blue hues to your landscape in winter when everything else is brown. If you want to establish a new lawn, or reestablish an old lawn, you have two basic choices: you can plant seed & sprout your own new turf, or you can buy sod & roll it out like new carpet, ready to go. There is no better way to welcome spring than with the bright, bold colors of flowers. Although these beautiful plants & flowers may only last one growing season, they do have add personality & interest to any space. Plant them in flower beds or along borders to give your home added curb appeal or in container gardens or hanging baskets to liven up a dull corner of your patio.